Twin pagodas were introduced to the Korean peninsula when the Silla dynasty brought an end to the long era of the Three Kingdoms Period of Korea in the mid- seventh century. 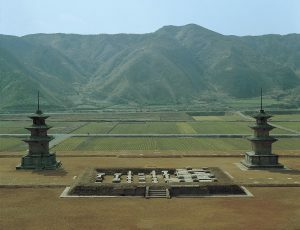 After Silla unified the peninsula, a large number of twin pagodas were erected in Korea until the fall of the dynasty in the tenth century. Unlike the previous assumption that twin pagodas were simply a doubled from of a single pagoda, I argue that they have complex ritual functions and religio-political meanings. As such, this talk shows that twin pagodas, while their form originated in China, experienced drastic changes in the Korean peninsula. 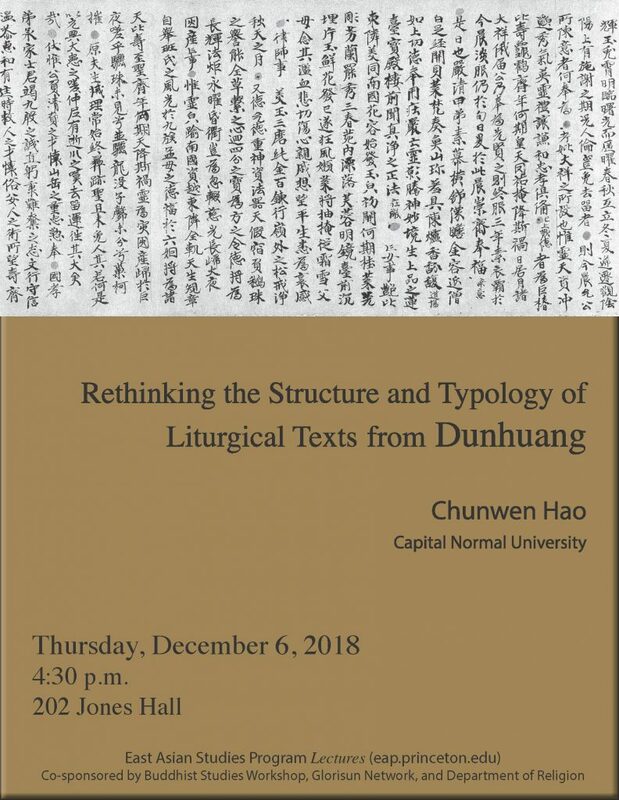 Based on archaeological data and inscriptions, this talk explores how the esoteric Buddhist ritual performed during the Silla–Tang War (670–676) and the dragon king legend of King Munmu (r. 661-681) transformed the twin pagodas into an architectural icon of state protection during the Silla dynasty. This presentation focuses on the political rhetoric hidden in the English translation by Timothy Richard (1845-1919) of the Awakening of Faith (Dasheng qixin lun 大乘起信論), one of the most popular Buddhist texts in East Asia. It first treats Richard’s translation as an important event in the intellectual history by placing it back to the distinctly different veins of Buddhist studies respectively in China and in the West since the nineteenth century. It then explores Richard’s creative interpretations for the two key Buddhist concepts of Mahāyāna and Hinayana as well as his hidden writing strategies while translating and interpreting Buddhist texts. Finally, the speech also analyzes in detail the ‘Western “matching-meaning”’ (yang geyi 洋格義) as expressed in the translation of the Awakening of Faith, bringing to light Richard’s Christian reconstruction of Buddhist scriptures over the course of translation. 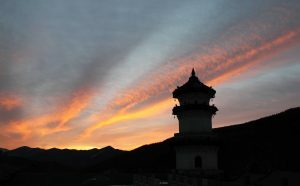 The Jizhao temple, which means tranquility and illumination, is located in Mount Cangshan of Dali Prefecture. 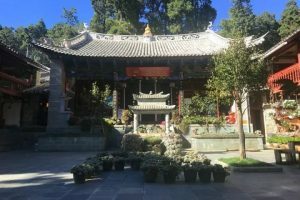 It was established in the early years of Ming Dynasty (1368-1644) and was rebuilt in 1919 by the Yunnan Governor Tang Jiyao. Its status as a Buddhist temple resumed in the early 1980s, when it changed from a monastery into a nunnery. Since then, it remains in tranquility and silence as its name implies. Meanwhile, with the vigorous growth of mobile internet and we-media, it has suddenly become an internet sensation almost overnight and was titled “the most beautiful nunnery”, and “the best temple of petty bourgeoisie taste”. Based on interviews with the abbot of Jizhao temple, Ven. Miaohui, and from speaking with lay Buddhists and some other local senior monks, this article tries to sketch out the process of its transformation, sociocultural contexts and subsequent effects as well.The speech looks back to four relating sociocultural factors in historical order: first, the common cultural memory of local people who cherish Cangshan mountain and the temples around it as the soul of local culture; second, the romantic imagination constructed by popular novels and mass media about Dali Buddhism, which in turn reshaped the recovery process of local temples; third, the utopic fantasy of reclusive hermits beyond the state control, held by immigratory artists and dissidents; and fourth, the changed religious ecologic pattern with the large influx of new Buddhist residents, driven by the apocalyptic prophecy of a famous monk. Although all above factors contribute to the sudden fame of Jizhao Temple, two key events should be emphasized: the temple’s elaborate reconstruction in 2012 and the subsequent voluntary advertisement through we-media, which exposed this small nunnery to the whole country in an explosive style. This sudden exposure through mobile internet changed the Jizhao Temple in many ways and subsequently brought out many unexpected effects. This lecture explores the intertwined relationship between materiality and textuality of stone inscriptions by focusing on their production, circulation, and interpretation. The attention to these issues is both the foundation of my research as well as where research breakthroughs could occur. The making of Tang stone inscriptions involved textual composition and stone carving. When studying this process, we should pay attention to 1) the composition of not only the text of the inscription but also other related texts; 2) the strategy and result of stone carving and its relationship to the cultural characteristics and status of the inscribed texts, 3) the artisanal aspect of the making of the stones and its evolution, and 4) the intricate network of relations among the person in charge of carving the inscription, the owner of the inscription and their family members, the composer of the text, the writer of the text, the copyist, the carver, the viewers and those who reproduce the text by further copying. Once a stone inscription was constructed, it became a part of the physical landscape where it was situated, sometimes even serving as a landmark site. Invited Professor Sasaki Shizuka from Hanazono University for lecture on “Past, present and future of Vinaya Pitaka Studies”, and Professor Yamagiwa Nobuyuki from Bukkyo University for lecture on “Overview of the studies on Vinaya Pitaka manuscripts”. Buddhist Studies has been conducted in such a way, from its inception, so as to privilege developments in India and South Asia, and to look at regional developments elsewhere as outgrowths and diversions of Indian based models. The story told in virtually all major textbooks is one that provides coverage of Indian developments, treating other regions, like East Asia, as an afterthought. 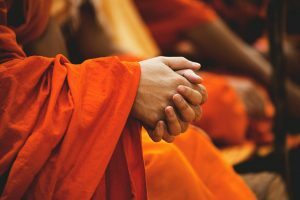 This was not accidental, but was the outgrowth of specific cultural frameworks that inspired the Western academic study of Buddhism.By the tenth century Buddhism in India had dissolved and ceased to be a source of inspiration. At the same time Chinese Buddhism initiated new forms of Buddhism, highly Sinicized, where Indian Buddhist content retained a passive influence but no longer as active inspiration. 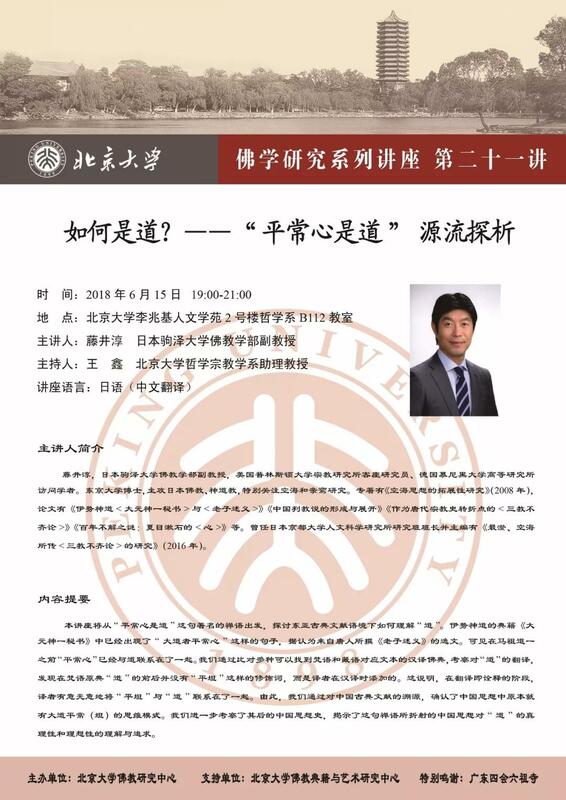 My presentation focuses on one region of China, Wuyue, centered in Hangzhou, that forged an identity as a new Buddhist homeland based on new and unprecedented forms of Buddhist thought, practice and institutional structures. 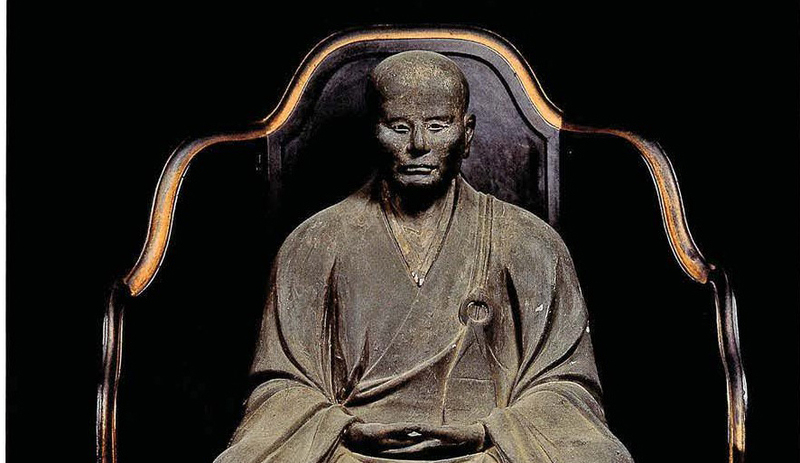 These developed to become foundational in the Song dynasty and served as models in the dispersion of new, authentic forms of Buddhism throughout East Asia that remain integral to East Asian Buddhism down to the present day. For event information (in Chinese), click here. For event coverage (in Chinese), click here. This paper is a preliminary study of the relationship between traditional community associations in villages, towns, and cities that originally involved semi-annual sacrifices and the Buddhist religion during the Wei, Jin, Northern-Southern, Sui and Tang dynasties (fourth-tenth centuries). It reveals that during Jin, Southern-North-ern and Sui, the main conflict between the early associations and Buddhist monks concerned the killing of ani-mals. It further shows that later, in the seventh-tenth centuries, the two traditions came to a less confrontational arrangement, involving mutual understanding and assimilation. In the earlier stage, Buddhist monks fought against Chinese traditional culture, trying to persuade village associations to accept foreign ideas and give up traditional practices. This changed during the second stage, when monasteries and monks adopted a more co-operative attitude. 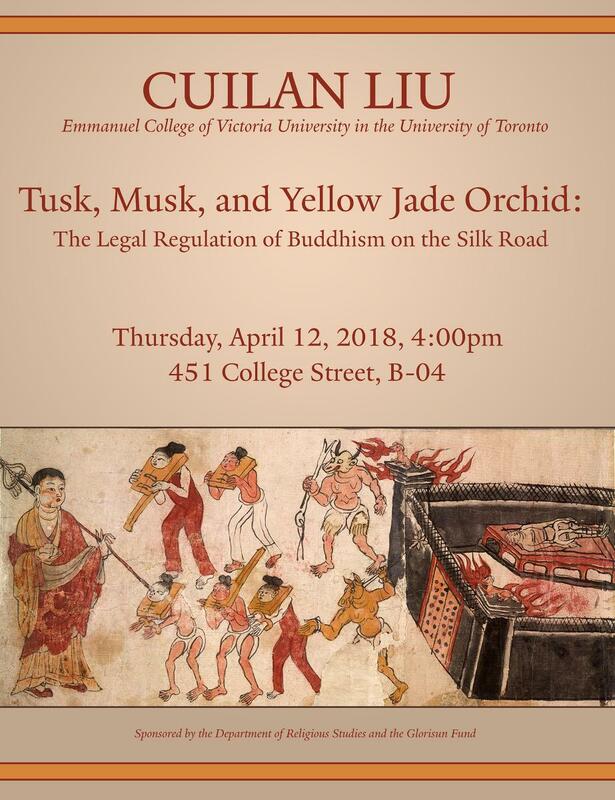 The lecture addresses the problem of taking life in Buddhism and Chinese culture, Confucian values, debates over the making of statues, mortuary practice, monasticism, and the conflict of cultures. Evidence is drawn from stone stelae inscriptions, biographies and histories, as well as manuscripts. During the Tang and Song dynasty, Chinese Buddhism underwent a great change, from theory investigation to religion practice. Buddhism in the Song dynasty showed a great orientation toward practice. Confession practices prevailed widely among Tiantai members, and confession ritual procedures were also produced during this time. Jingyuan（1011-1088）, a revivalist scholar of Huayan School, had to make efforts to implement the ideas of his own school in order to keep up with the trend. Huayan School lacked a practical aspect. Jingyuan edited Xiuzheng yi, reducing eighteen fascicles into one. However, this work actually reduced the characteristics of Huayan Confession itself, which emphasizes contemplation and thought. The Confession not only constituted a ritual that eliminates individual transgressions and karma, it also included rituals that aim at higher goals. At that time, with particular concerns in the background of “Protecting the Nation via Buddhism” (Guojia Fojiao), it transformed into a ritual that eliminates common karma, in order to protect the nation. 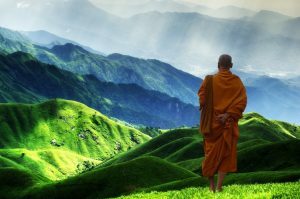 In the Song periods, Buddhist communes or societies continued to develop. They brought together various beliefs, and became a type of community united by Confession practices. Under the influence of Confession practices, Chinese Buddhism became popularized and socialized in this period. During the Tang and Song dynasty, Chinese Buddhism underwent a great change, from theory investigation to religion practice. Buddhism in the Song dynasty showed a great orientation toward practice. Confession practices prevailed widely among Tiantai members, and confession ritual procedures were also produced during this time. Jingyuan 净源 (1011-1088), a revivalist scholar of Huayan School, had to make efforts to implement the ideas of his own school in order to keep up with the trend. Huayan School lacked a practical aspect. Jingyuan edited Xiuzheng yi (圓覺經修證儀), reducing eighteen fascicles into one. However, this work actually reduced the characteristics of Huayan Confession itself, which emphasizes contemplation and thought. The Confession not only constituted a ritual that eliminates individual transgressions and karma, it also included rituals that aim at higher goals. At that time, with particular concerns in the background of “Protecting the Nation via Buddhism” (Guojia Fojiao 國家佛教), it transformed into a ritual that eliminates common karma, in order to protect the nation. In the Song periods, Buddhist communes or societies (sheyi 社邑) continued to develop. They brought together various beliefs, and became a type of community united by Confession practices. Under the influence of Confession practices, Chinese Buddhism became popularized and socialized in this period. In this talk, Professor Wendi Adamek focuses on two rock-cut tributes to the Nirvāṇa-sūtra’s characterization of nirvāṇa as permanence, joy, self, and purity (chang le wo jing 常樂我凈). In the first part she introduced these terms, known as the “four inversions.” Chinese interest in the Nirvāṇa-sūtra’s chang le wo jing rubric can be seen in various Northern Dynasties, Sui and Tang works, both textual and visual, that support tathāgatagarbha (buddha-matrix) soteriology. At the first site she examines, the middle or central cave of Shanyingshan 善應山 (Henan), was an illustration of the chang le wo jing rubric in the Brāhmana Jātaka from the Nirvāṇa-sūtra, as well as a passage on contemplation of the body from the same sūtra. Second, on a rock-face near Dazhusheng 大住勝 cave at Baoshan 寶山 (Henan), was an undated inscription consisting of variations on the Brāhmana Jātaka verses. 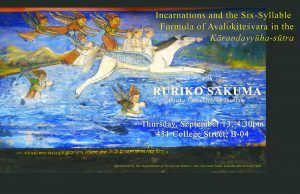 She discusses, in turn, the Nirvāṇa-sūtra and these two sites of inscription and image in order to highlight their illustrations of “inversion” as the key relation between no-self and the actualization of “self” promised in the sūtra, an alluring potential that was found courted by various names in the body of literature loosely designated as “tathāgatagarbha” texts. In the two decades between 1211 and 1234, the Mongols swept through North China under the Jurchen-Jin dynasty (1125-1234), waging the most destructive war in the history of imperial China. Wiping out more than half of the population and ruining much of the farmland, the Mongols destroyed the underpinnings of the entire society in North China and caused the old order to collapse. From the early years of their conquest, instead of relying on Confucian-educated literati to rebuild local society like the Jurchens had done, the Mongols shifted financial and political support to Quanzhen Daoist and Buddhist religious orders, making their clergy one of the most powerful social groups. Men from different social levels, and a surprising number of women as well, assembled in the Buddhist and Daoist orders and played significant roles in rebuilding postwar society, reviving the economy, and reshaping social values. Clergy and their religious institutions acquired sufficient power to occupy considerable social space between family and state, which led to the emergence of a new social order in North China beginning in the Mongol-Yuan period and extending well to the following Ming dynasty (1368-1644). This distinctive social order is utterly different from the scholarly image of a literati-centered local society in imperial China after the eleventh century. 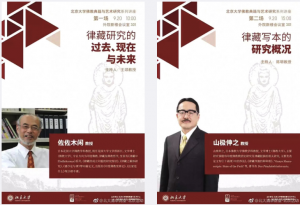 A public event with lectures in English and Chinese by two keynote speakers (Susan Whitfield, International Dunhuang Project; Du Doucheng, Lanzhou University) and responses by two visiting scholars (Yu Xin, Fudan University; and Annette Juliano, Rutgers University). Attendance: 105. To learn more, click here. Is the Silk Road a meaningful or misleading concept for our understanding of pre-modern Afro-Eurasia? How has its emergence as a worldwide brand and, most recently, as a politico-economic strategy, threatened or assisted scholarship? Should we reject or embrace it? Susan Whitfield will consider these questions, looking at the origin, history and growth of the Silk Road concept and its modern manifestations. The overland Silk Road may have been opened in ancient times, the maritime route may have developed long before the Song dynasty, and political and military interests may have been stronger than economic ones. 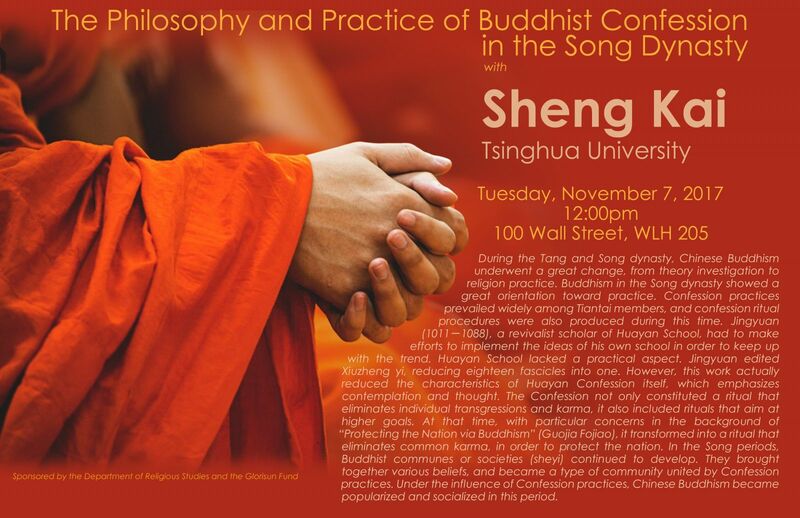 This talk introduces recent discoveries in Buddhist archaeology in Gansu province against this historical background. Latour’s ideas and terminology have been widely influential within social and cultural anthropology, even amongst those who are not inclined to follow Actor-Network-Theory. Latourian vocabulary for describing the modernity we have never had is acceptable and often suggestive, but Latour’s attack on individual and collective human agency is particularly ill suited to explaining the rise of new kinds of identity. I describe the rise of new ‘ethnic’ and ‘macro category’ identities in Nepal and suggest that the analysis applies to many other social identities as well. I argue that activists are masters and mediators of Latourian ‘hybridity’.